Wire mesh is a highly versatile material used in art and, above all, sculpture. Its adaptability allows creations to be brought forth that stand out for their solidness or even their lightness. The defining trademark of Michelle McKinney‘s sculptures is the delicate braiding of the mesh, which transforms into pretty metallic wings. 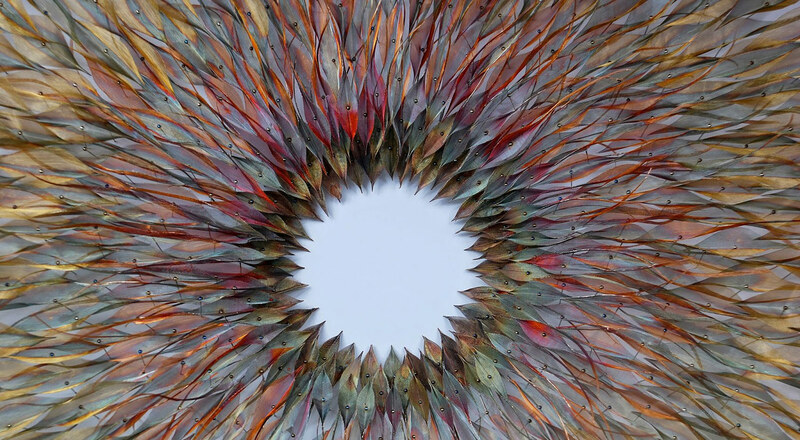 Her ethereal sculptures, brimming with colour, resemble birds, leaves, butterflies… McKinney, a jewellery designer, says she enjoys ‘the contrast between the solidity of the material and the delicacy and fragility of the objects’. The artist began creating jewellery but quickly realised that she wanted to work on a larger scale, that she ‘wanted to explore bigger ideas, bring various minute elements together to create a whole‘. Her work is strongly inspired by nature; as she puts it: ‘I want to capture beauty in time’. In addition, McKinney explains that, as an artist, she is interested in conveying a ‘sense of movement with her work while at the same time capturing each element’. The material most favoured by McKinney is stainless steel, highly prevalent in industry, which gives her works a strong sense of contrast between the hardness of steel and the delicacy of the moulded objects.